Optical coherence tomography (OCT) is a newly developed clinical imaging technique that can show cross-sectional tomographs of the retina and choroid.7·8 In this report, we show an occult pigment epithelial detachment (PED) that was only revealed by OCT in a patient with macroglobulinemia. The eyes showed serous retinal detachment as a retinopathy of hyperviscosity syndrome. A 62-year-old Japanese man presented with visual disturbance and metamorphopsia in both eyes of six months duration. There were no other symptoms. On examination, his visual acuity was RE, 10/20 and LE, 6/20. Intraocular pressure was 1 1 mm Hg bilaterally. Laboratory examination revealed a red cell count of 294 X 104/dL, white blood cell count of 48 X 102/dL, hemoglobin 8.4% g, hematocrit 28%, platelet count 169,000/mm3, total protein 10.0 g/dL, albumin 43.7%, beta globulin 6.0%, gamma globulin 42.3%. The marked increase of the gamma globulin led to a diagnosis of macroglobulinemia. Slit-lamp biomicroscopy, ophthalmoscopy, fluorescein angiography, indocyanine green (ICG) angiography, and OCT were performed. Slit-lamp biomicroscopy revealed normal anterior segments. An ophthalmoscopic examination disclosed a serous retinal detachment in and around the macula in both eyes (Figure 1). The disks were normal in color with distinct margins in both eyes. The retinal veins were dilated and tortuous with no spontaneous pulsation. Microaneurysms and dot hemorrhages were present in all quadrants in the mid- to peripheral retina. No retinal exudates were seen. Figure 1. Photographs of fundus demonstrating a serous retinal detachment arrow heads) in and around the macula. The veins are dilated (A) right eye; (B) left eye). Fluorescein angiography (Figure 2) demonstrated venous and capillary bed abnormalities, especially microaneurysm formation and areas of capillary closure in the mid- to peripheral retina. The retinal veins showed generalized axial dilatation and tortuosity. The intraretinal circulation time was delayed. However, no leakage or pooling of the fluorescein corresponding to retinal pigment epithelial detachment was demonstrated in and around the macula region where the serous retinal detachment was observed by ophthalmoscopy. ICG angiography (Figure 3) disclosed no delay of the dye filling time but displayed a delay of intrachoroidal circulation. No abnormal findings corresponding to retinal pigment epithelial detachment were observed in the ICG angiograms. OCT (Figure 4) revealed the presence of a large retinal pigment epithelial detachment beneath the serous retinal detachment in both eyes. Horizontal scan of OCT displayed a high elevation of the retina. The large elevation of a highly reflective band corresponding to the retinal pigment epithelium (RPE) was seen under the neurosensory retinal detachment. A dome-shaped, optically-clear space, corresponding to serous fluid accumulation, was evident over the reflection of the choroid. Choroidal backscatter was mildly diminished in the area of the pigment epithelial detachment. Serum hyperviscosity syndrome is associated with qualitative and quantitative changes in the serum protein. Hyperviscosity is caused primarily by an increase in the gamma globulins.2·9 It is generally accepted that ocular changes are present in 60% to 70% of patients and they vary from slight venous dilation progressing to gross venous engorgement with tortuosity and segmentation, retinal hemorrhages and exudates, to central retinal vein occlusion, retinal edema, and exudative detachment.10"12 Detachments of the sensory retina and retinal pigment epithelium have been reported pathologically in severe cases.13"15 Vast numbers of microaneurysms, with most situated peripherally and almost none in the posterior pole, have also been reported. ' ' Our patient showed mild venous dilation, retinal hemorrhages, exudative retinal detachment, and a large number of microaneurysms as previously reported. Fiuorescein angiography has been used with great advantage in the study of this retinopathy.3-6'10 We found abnormal and delayed circulation times in the retina and the choroid by fluorescein and indocyanine green angiography. However, in this case, fluorescein angiography did not display subretinal leakage and the retinal PED. OCT revealed the presence of a large retinal PED beneath the serous retinal detachment in both eyes. Strands of rather high reflectivity on the side of an elevation can also be seen under a retinal detachment, in retinoschisis and cystoid changes of retinal structure around macular holes. However, the strands of high reflectivity on the side of elevation in our case is continuous with the high reflectivity of the RPE layer, and this high reflectivity showed a complete dome-like shape. These findings demonstrate that this highly reflective band corresponds to the retinal pigment epithelium and indicates a retinal PED. Retinoschisis and cystoid changes of retinal structures, on the other hand, appear as sectional changes corresponding to the intraretinal cysts in OCT images. In addition, we found optically-clear space beneath this dome-like, highly reflective band and a reflective band corresponding to the neurosensory retina. This image also supports the conclusion that the strand of high reflectivity is caused by a RPE detachment beneath the serous retinal detachment. Figure 2. Fluorescein angiograms showing diffuse capillary bed dilatation, and many microaneurysm formations in midperipheral retina. There are no abnormal findings in the macula: (A) right eye, early phase; (B) right eye, late phase; (C) right eye, midperipheral retina; (D) left eye, early phase; (E) left eye, late phase; (F) left eye, midperipheral retina. Backscatter from below the elevated retina and the posterior part of the elevation might not be as highly reflective as it would be in a typical retinal PED. However, we know that reflectivity of backscatter beneath the retina depends on the nature of the RPE layer. Long-standing retinal PED, as in this case, would change the optical permeability of RPE layer because of the depigmentation of RPE cells. Thus, it would not be as highly reflective as it would be in typical cases and also result in high backscatter in the choroid. Figure 3. lndocyanine green angiograms disclosing no delay of the dye filling time but showing the delay of intrachoroidal circulation times. (A) right eye, 21 .3 sec; (B) left eye, 39 sec. On the nasal side of the elevation, there is a layer of high backscatter that continues under the elevated parts and becomes thinner toward the center (Figure 4B). This finding is more likely caused by a RPE detachment because backscatter under the serous retinal detachment usually shows high backscatter corresponding to the RPE layer and choroid. In our case, the backscatter that continues under the elevated parts is markedly diminished compared to that of under the retina without elevation. It would also support the presence of a RPE detachment. We cannot explain why the backscatter becomes somewhat thinner toward the center. However, we suggest that the accumulated hyperviscosity materials would alter the backscatter. Under the high elevated part in the center, there is a large amount of accumulated hyperviscosity materials that is optically transparent but with characteristics that are different from the subretinal fluid observed in typical serous retinal detachment. This may explain why the backscatter becomes thinner toward the center. Figure 4. Optical coherence tomography demonstrating a retinal pigment epithelial detachment (PED) (arrows) beneath the serous neurosensory retinal detachment: (A) right eye; (A') arrow demonstrating horizontal scan on OCT; (B) left eye; (B') arrow demonstrating horizontal scan on OCT.
We have demonstrated an occult PED under a serous retinal detachment only by OCT. Fluorescein angiography did not disclose the PED because there was no leakage or pooling of fluorescein, which is usually associated with PED. At present, the reason why fluorescein angiography did not demonstrate the leakage is not definitely known. However, previous studies have reported deposition of PAS-positive material in the retina of patients with macroglobulinemia,4'6'12and ìmmunofluorescent techniques proved these deposits to be IgM.4 These deposits were mainly localized m the outer plexiform layer with some material present in the inner retina and about p ho to receptors. PAS positive materials were also demonstrated in the lumen of retinal vessels. We did not find the OCT findings as an accumulation of material within the retina with subsequent splitting of the layer. Retinal and retinal pigment epithelial detachment by proteinaceous material that is rich in IgG has also been reported.13" 15 The location of these deposits in the retina would depend on the molecular weight or size of the accumulated materials. We therefore assume that deposits of gammaglobulin, which have accumulated in the subretinal pigment epithelial space, were present in this case. This then leads to the optically-clear space observed beneath the retinal pigment epithelial layer by OCT. It is well known that retinal pigment epithelium is a barrier between the retina and choroid and also plays an important role in the transportation of nutritional molecules from choroid to the retina to maintain the retinal homeostasis. The hyperviscosity gamma globulin molecules could not be transported to the neural retina in this case because of their high molecular weight. The accumulation of this hyperviscosity material, probably infiltrated from the choricapillaris to the subretinal pigment epithelial space would block the leakage and pooling of fluorescein corresponding to the retinal pigment epithelial detachment. The patient did not wish further examinations or therapy, therefore we could not determine the specific type of macroblobulins. This is the first report of a retinal pigment epithelial detachment revealed by OCT in the retinopathy of hyperviscosity syndrome. 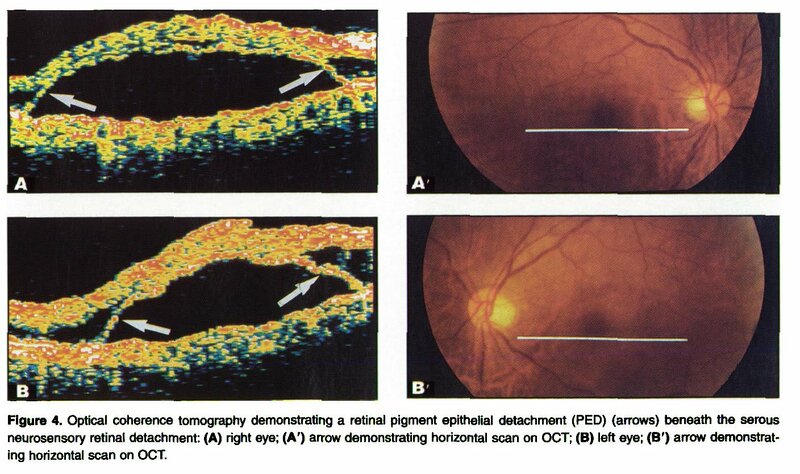 The PED was only detected by OCT and this technique proved the occult retinal pigment epithelium detachment under exudative retinal detachment in the retinopathy of hyperviscosity syndrome. 1. WaldenstrÖm J. Incipient myelomatosis or "essential" hyperglobulinemia with fibrinogenopenia: A new syndrome? Acta Med Scand. 1944;! 17:216-247. 2. Bloch KJ, Maki DG. Hyperviscosity syndromes associated with immunoglobulin abnormality. Semin HematoL 1973:10:113-124. 3. Thomas EL, Oik RJ, Markman M, et al. Irreversible visual loss in Waldenstrom's macroglobulinemia. Brit J Ophthalmol. 1983;67:102-106. 4. Friedman AH, Marchevsky A, Odel JG, et al. Immunofluorescent studies of the eye in Waldenström's macroglobulinemia. Arch Ophthalmol. 1980;98:743746. 5. Orellana J, Friedman AH. Ocular manifestation of multiple myeloma, Waldenstrom's macroglobulinemia and benign monoclonal gammapathy. Surv Ophthalmol. 1981;26:157-169. 6. Rosen ES, Sîmmons AV, Warnes TW. 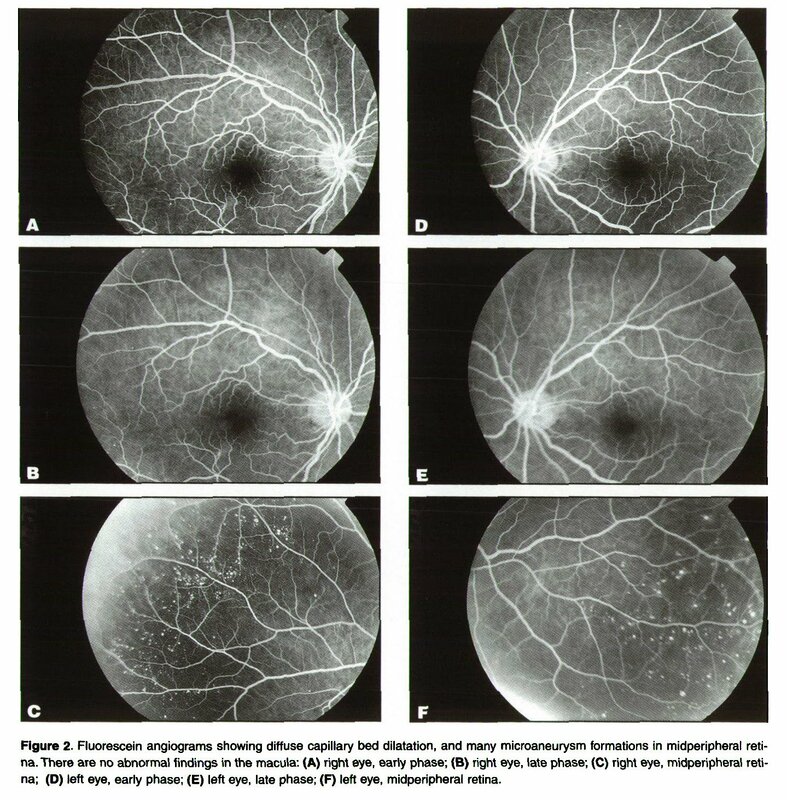 Retinopathy of Waldenstrom's macroglobulinemia: photographic assessment. AmJ OphthalmoL 1968;65:696-706. 7. Hee MR, Izatt JA, Swanson EA, et al. Optical coherence tomography of the human retina. Arch Ophthalmol 1995;113:325-332. 8. Puliafito CA, Hee MR, Lin CP, et al. Imaging of macular diseases with optical coherence tomography. Ophthalmology. 1995;102:217-229. 9. Reinhart WH, Lutolf O, Nydegger U, et al. Plasmapheresis for hyperviscocity syndrome in WaldenstrÖm and multiple myeloma: Influence on blood theology and the microclrculation. J Lab Clin Med. 1992;! 19:69-76. 10. Luxenberg ML, Mausolf FA Retinal circulation in the hyperviscocity syndrome. Am J Ophthalmol. 1970:40:588-598. 12. Spalter HF. Abnormal serum proteins and retina! vein thrombosis. Arch OphthalmoL 1959;62:868-881. 13- Retinal and choroidal manifestations of systemic disease. In: Singerman LJ, Jampol LM eds. Retinal and choroidal manifestation of hematological diseases. Baltimore: Williams & Wilkins; 41-79. 14. Khouri GG, Murphy RP, Kuhajda FP, et al. Clinicopathologic features in two cases of multiple myeloma, Retina. 1986;6:169-175. 15- Ashton N. Ocular changes in multiple myelomatosis. Arch OphthalmoL 1965:73:487-494.